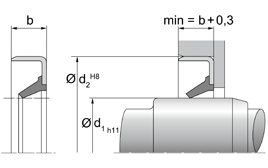 The WBO is a single-action rotary shaft seal for rotating or pivoting shafts. 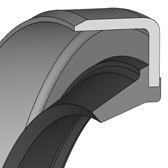 The sealing lip design without a spring produces less friction. As a result, the sealing action in comparison to rotary shaft seals with energised springs is reduced. Tight and accurate fitting is achieved by the metal outer casing. The WBO model has limited sealing action with thin fluid or gaseous media and in split housings. To guarantee a high level of static sealing on the outer surface, better surface treatment of the housing bore is necessary. The nominal widths mentioned on the following pages represent the standard dimensions. They are generally in stock or can be delivered at short notice. Other dimensions and different designs, e.g. double dust protection lip, spiral on the sealing lip, springs or metal inserts made of other steel grades can be produced as well as all kinds of special designs. Minimum quantities may be obligatory for dimensions outside of the standard.